A visual schedule is a series of pictures showing a number of activities or tasks to be completed or have been completed for the day or the week, or step-by-step guidelines for an activity. 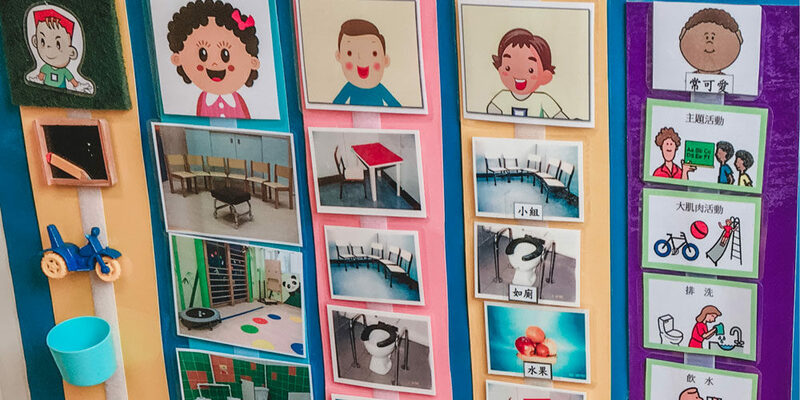 Visual schedules help children understand what will happen and to manage challenging tasks. Pairing visual cues with your verbal instructions provide extra support to your child, which helps to reinforce his/her understanding on what’s expected for him/her. It is helpful for your child to receive the information from more than one form. Also, visual schedules allow your child to revisit the information when he/she needs to. Some children may have difficulties in retaining the instructions in their memory and visual schedules are great support for them. Linking the instructions to the pictures also encourages children to make meaningful connections between words and pictures. This is important for the development of literacy skills in the future, such as understanding pictures and abstract symbols. Some visual schedules incorporate words with pictures (e.g. showing the word at the bottom of the picture), which contributes to early comprehension and recognition of words. Further, visual schedules are useful for teaching children abstract time sequencing such as ‘First, Next, Last’ and days of week. Even adults get uneasy with transitions and new routines sometimes. Visual schedules clearly display the sequence of activities, letting your child know what is expected and what is next. This sense of security and understanding of expectation help children predict changes and ease anxiety related to changes. Visual schedules provide an easy way for the children to find out what is expected of them and what to do next. This reduces the need for adult cues on the next activity. Knowing the schedules enhances their independence. Visual schedules can be used to guide your child from finishing a task (e.g. putting on a jacket) to completing a routine (e.g. morning routine). Eventually, the ability to follow the schedule and increased independence foster the self-esteem of your child. How to make and use visual schedules for your child? Think of what this schedule is used for and break the daily routine or the activity into several steps. Pay attention to minor details (e.g., when brushing teeth, the first step is to take the teeth brush out from its holder) as these may be helpful for your child. Please note that all children are different and visual schedules can be tailored to meet individual needs. Some children may need tasks broken down to the smallest detail while other children can handle bigger steps. Know your child and individualise their schedules. Determine the pictures that best fit your child. Choose the format of the picture (e.g. pictures of actual objects/cartoons/texts) according to his/her developmental stage, distractibility, and functionality. You may add a written text underneath the picture to guide your child to early literacy. Show and teach your child how to use the schedule. Let your child try out the schedule.